Delivery trucks rumble down a thruway in Brooklyn’s East Williamsburg, a largely industrial neighborhood where small factories have, over the past two decades, made way for artist studios. Kadar Brock’s workspace is on the top floor of a two-story building in the area. 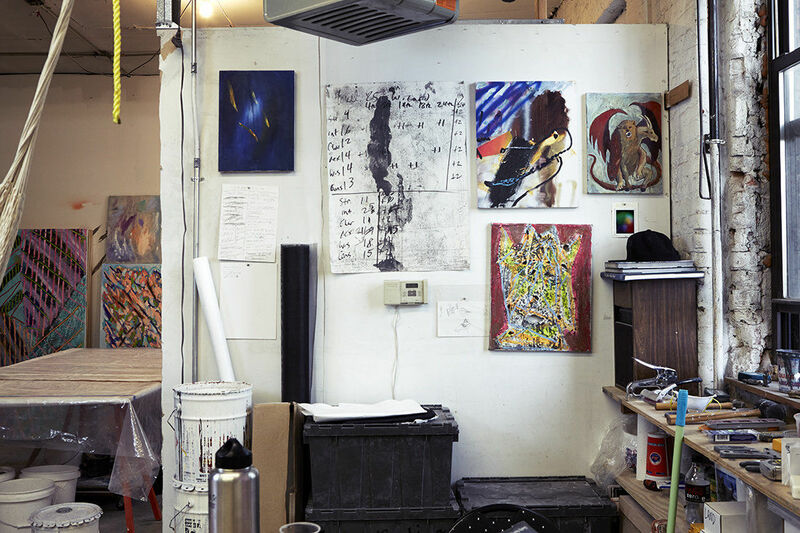 Enter an unmarked door and climb a steep stairwell to a long narrow hallway; the 5,000-square-foot full-floor space is subdivided into numerous smaller studios that Brock shares with 15 other artists, many of whom he met while he was a student at Cooper Union. His studio is an imperfect rectangular shape—the result of recently merging two studios together. 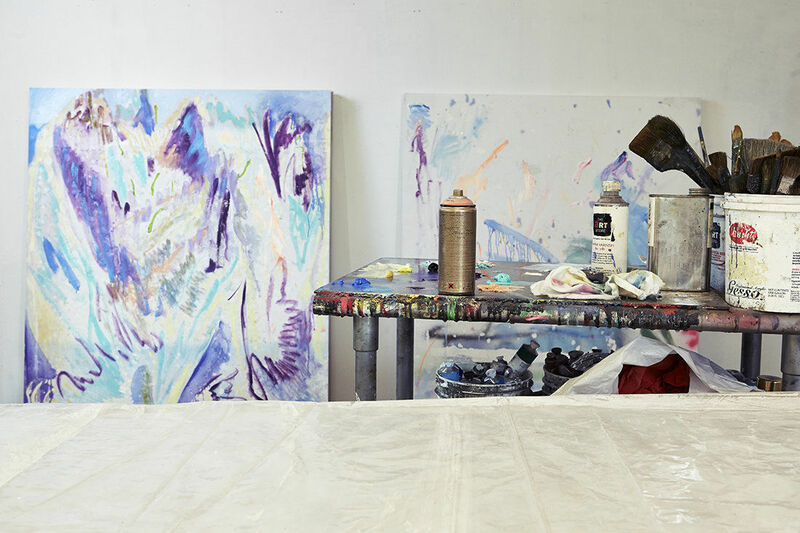 Each part of Brock’s studio serves its function: one area is where he paints his soon-to-be-destroyed canvases—usually boldly colored geometric compositions. The middle section of the studio is a table where he alters or destroys these paintings by sanding, priming, and scraping them—techniques that Brock has become known for through three distinct series of abstracted, process-based works: his sanded paintings, with their beautifully distressed patinas, shreds of the canvas sanded away to show the stretchers behind, and swirls of faded pastel colors; his “ritual” works, where he scrapes paintings to produce chips or confetti-looking pieces that are carefully applied to a canvas to create a dense and delightfully gestural work sans brushstrokes; and his dust works, where Brock decimates up to 10 painted canvases into a fine debris, which he uses to construct his puckered and moonscape-like compositions. 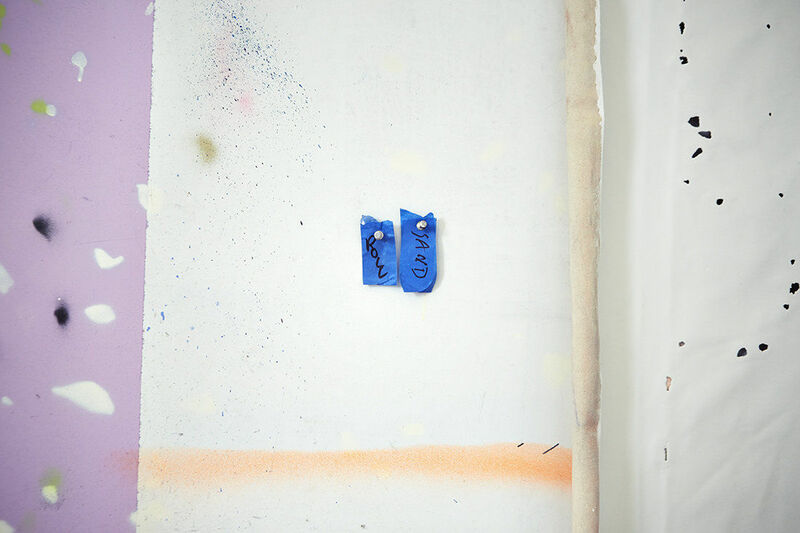 At the far end of the space, behind a thick vinyl curtain, Brock spray-paints his sanded works. 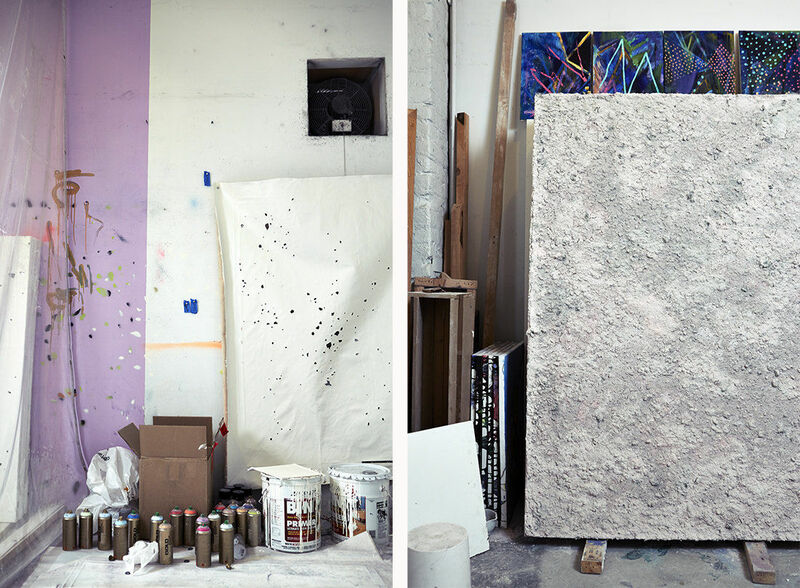 His studio is an ecosystem—and an efficient one—in which the artist’s methodical and ritualistic process makes for a consistent upcycling of materials across the space: when he spray-paints, he uses a canvas as the drop cloth; that canvas becomes the start of a painting; and that painting has two fates: one sliding door is going under the razor and the industrial sander, before being coated with layers of pigments and primed, sanded, and primed, a process repeated until the desired effect is reached; the other fate is to be martyred into chips or dust. 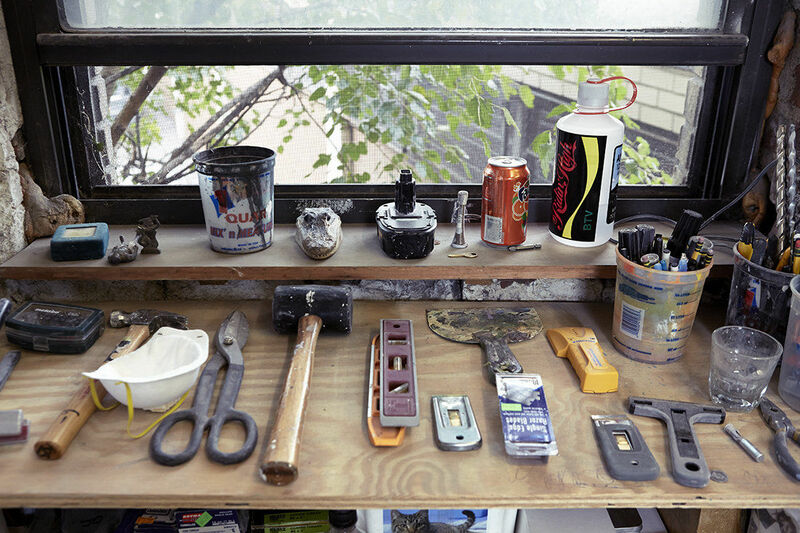 His methodical approach also comes across in the organization of his tools and materials in the studio: spray paint cans, acrylics, and brushes inhabit a stainless steel rolling cart; on a shelf, a palette scraper, an X-Acto knife, levels, and hammers are neatly arranged; reference books are loosely piled; and in black containers stacked along the walls is where Brock stores the remnants of destroyed paintings, the resting place between their destruction and their afterlife. The whole studio is touched by this dust. It’s hard not to leave without some remnant of it on your clothes, though that adds to the charm of the visit. Hung in the center of the studio is a stringy hammock, where the artist naps during breaks. This newfound system would free Brock from the weight of painting’s history—and from his romantic vision of the artist standing before the canvas making autonomous actions. “I started loathing it because it just seems impossible, and weighted, and fucked,” he remembers. “And all you want as an artist is a way to dodge some of that historical subconsciousness. And so to me it was like simultaneously setting up this entire other character system that’s making these paintings, [which was] also a way to critique and talk about what those dynamics and belief structures and myths are, and then also create a free space for me to do stuff.” This would result in the aforementioned series of works that, over the past two years, have turned the heads of many dealers and collectors. New York-based collector Karine Haimo remembers first discovering Brock’s work at a group show at The Hole in 2012. She and her husband—whose collection includes works by Sam Moyer, Aaron Curry, Adam Pendleton, Alex Prager, Adam McEwen, Eddie Martinez, Chris Succo, and many others—tried to buy one of his works but they were all sold out. However, The Hole director Kathy Grayson had two works not on display in the show, which Haimo says they bought right on the spot. Aside from being drawn to the narrative behind the piece—the notion of artmaking as magic—she was drawn to the shifting nature of the work. “The piece changes throughout the day. Because of its multi-layered surface, in the morning it’s a beautiful pink, the afternoon it gets to be a dark blue and in the evening it’s rather purple,” she explains. 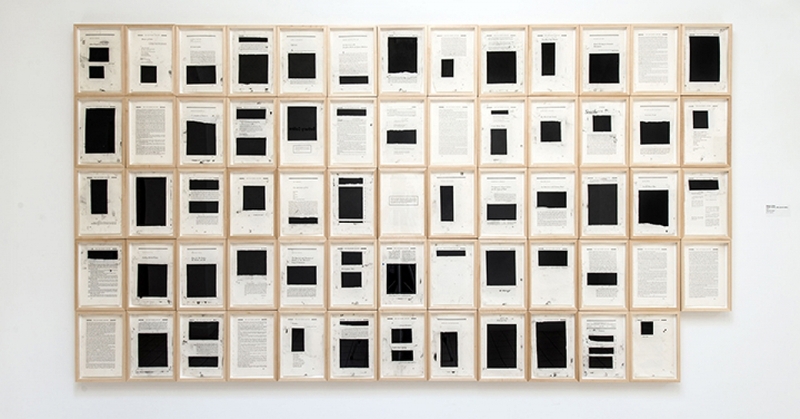 In 2013, Brock had his breakout solo show in New York, at The Hole, entitled “dredge.” The entire main gallery space was filled with new paintings. The show very quickly sold out. And since, with representation at London-based Vigo gallery and now Almine Rech, his work has wait lists of collectors interested in buying. This week, Miami will be abuzz with Brock. At Art Basel in Miami Beach, Almine Rech will feature three new works—one minimally hued, sanded work, a large-scale dust piece, and a sculpture cast from old stretcher bars and plastic drop cloths from the studio, thus appropriating surrounding dust and debris. Sculpture is a brand new direction for the artist and this will mark its premiere to the public. At Untitled, Vigo will feature six new works by Brock, including sanded pieces (some that have taken almost a decade to complete) and dust works, and another premiere of Brock’s three-dimensional pieces, a totem-like plaster piece perched on a wood plinth. 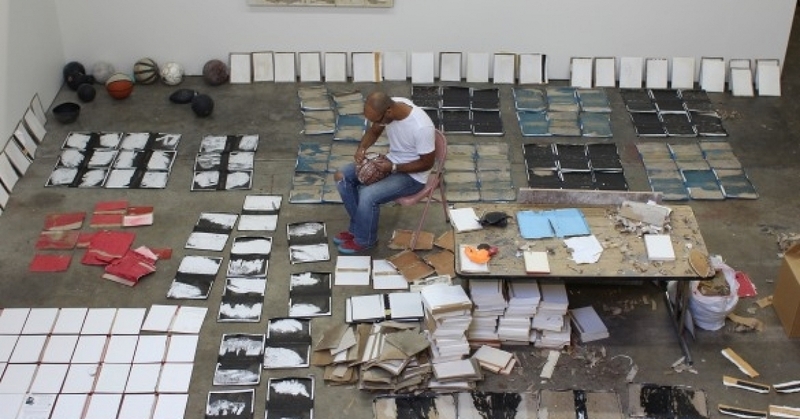 Shortly after Miami, in January 2015, Brock opens a solo show at Vigo.